The general consensus is that it’s a buyer’s market. It is not uncommon to find vendors who are willing to discount their price significantly from list. The expectation is that as the market recovers, rental rates will stabilize and prices will start to hold. Investors can do well, if they maintain discipline and offer prices that provide them with a strong annual cash/rental return. Liquidity – Investments in real estate tie up large sums of cash. If liquidity is needed quickly, it may not be readily available. Equity and bonds are advantageous because there is a ready market that allows conversion for them to cash more easily. Also bear in mind that depending on the property, real estate transactions may take months or years to achieve a successful sale at a fair price. Otherwise, heavy discounts may need to be applied to achieve a quick sale. Timing – If an investor is looking at holding real estate for the short term, it may not be the best option, given the current depressed nature of the market. Since it seems to still be a buyer’s market, investments need to be held for the medium to long-term, for appreciation. Investors who have cash and can afford to be patient, could benefit greatly. Rate of return - The rate of return on real estate properties is dependent on the price paid for the property, its incremental cash flows and the proceeds that are ultimately realized from its resale. 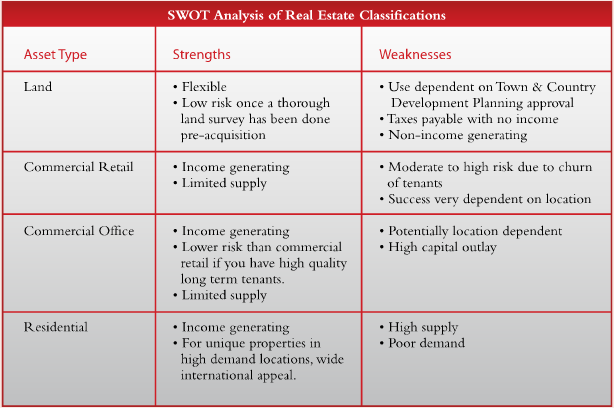 The ability to achieve suitable returns is heavily influenced by rental rates, occupancy and its eventual sale price. This will depend on location, type, visibility, condition etc. The old adage still holds true; it’s all about location. Is it right for me? Like any other investment, the decision of whether or not to invest in real estate requires careful consideration of all of the relevant risk factors. It should be discussed thoroughly with your advisors. Though real estate is not without risk, it provides a viable, long- term investment option to an astute investor in the current economic climate. Given the right combination of cash flows, price and location, it can hold its value, provide a hedge against inflation and give good, long-term returns in real terms.